At Magnum, we know how important it is for your pickup truck to depict your personality. Our customers want to drive the coolest trucks around, and sometimes that means after they’ve gotten one of our headache racks, the next step is putting in a lift kit and tuning it. That brings us to EFILive. EFILive is a scan and tune tool that allows you to custom-tune your diesel truck. Benefits to tuning your truck include increased horsepower, MPGs, additional torque and much more. Tuning should only be attempted by experienced users or professionals. 1. EFILive provides users with real-time feedback via the data-logging function. “The type of information you now have the ability to gather is virtually limitless—from boost to EGT to transmission shifting strategies” (via TruckTrend.com). 2. It’s super easy to figure out whether EFILive supports your diesel truck or not. Simply head to the EFILive website and browse the make and model to get started. Looking for beneficial tech tips, customer support or general FAQs? EFILive has you covered. 3. 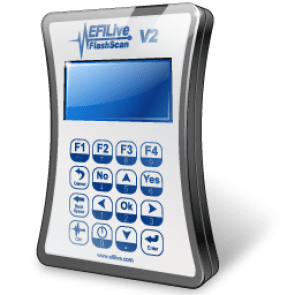 EFILive’s tuning tool offers some serious options, including a valet mode, staging mode, real time variable pulse width control, manually control gear selection and much more (via rollinsmokediesel.com). 4. There is zero wait time when switching your custom tunes. “Want a half-fuel tune for city driving or emissions? A tow tune? A race tune? Well, you can have all those at the simple flick of a switch—in seconds. With traditional programmers, you might have to wait several minutes for a new tune to load” (via TruckTrend.com). 5. Software updates are freely available at the EFILive website. Click on this link to go directly to the Download Software page. According to the site, “there are 3 types of software releases that customers can choose from, depending on the current development cycle. Customers’ individual circumstances and tolerances will determine which software is most suited to their application; Public Release Software, Public Pre-Release Software/Release Candidate Software, and Beta Software. Adrenaline Truck Performance: specializing in diesel truck performance tuning, parts, and accessories. A brick and mortar shop providing top-notch customer service for our walk-in and online customers. SoCal Diesel: 26 years of high-performance automotive cylinder head and related parts engineering, design and manufacturing can be found here at Advanced Motorsports Technology and its subsidiary SoCal Diesel. RidgeRunner Diesel: Entering their 10th year in business with a proven record of top running street trucks, daily drivers, weekend racers and pullers and top performing/all out dedicated race trucks and sled pullers. Fleece Performance: The FPE’s engineering team is equipped with all the tools required to develop and test new products from turbochargers to injection pumps to electronic controllers. From the first brainstorm to the finished product, quality, innovation, and customer satisfaction are the focus. Duramaxtuner.com: Balancing power, heat, drivability and efficiency is something that takes time and a solid understanding of engine dynamics. Those who plan on running their trucks loaded for an extended period of time should take care to match their tuning and parts closely to the application; Duramaxtuner.com understands your need for reliable, powerful, and consistent power delivery. PPEI: Power Performance Enterprises, Inc (PPEI) by Kory Willis strives to bring your diesel truck to its full potential. Motivated to better your truck and ourselves for 5 years, they will continue to offer their highest quality tuning, support, and service to our customers.